Have you ever shopped for a full grocery order during the school holidays? I’m talking the “We don’t have ANY food in the house and my trolley is so full it has a slight lean to one side and keeps steering in that direction, AND I have a large packet of toilet rolls sitting on top of the handle of the trolley about to fall on the two dozen eggs I have sitting in the toddler seat” kind of order. Well, that was me yesterday. Mr8 was watching the kids and I was determined to grab as much food as I could and enjoy a little Me Time as I wandered up and down the aisles. Unfortunately it seemed that every other parent in town had the same idea, except that they weren’t as lucky as I was and had to bring their kids with them, so the place was packed. When I first arrived I thought I had picked the perfect time to stock-up…..the place was practically empty. But then, as I was half way through the fruit and vege. section (which I know I should leave to last so the grapes and bananas don’t get squashed in the bottom of the trolley, but I never do) THEY arrived! Mums, Dads, kids and Grandparents, they were everywhere. I don’t know what happened, maybe a kids session at the movies had just finished or something, but it seemed like every parent with school-aged kids converged on my local supermarket. And my peace ended!! Now you know I love kids, I have six. But parents shopping with multiple kids have multiple things on their minds and when they stop their trolleys in the middle of the aisle so no-one can get past, they aren’t doing it deliberately, they’re just trying to remember exactly what it is they are looking for, compare prices, mark said item off their list if they have one, and keep an eye on any kids they can’t fit in their trolley. I know, I’ve been there. I remember once when Mr8 was away for 4 weeks and I had to shop for a birthday party I was throwing that weekend and I had no choice but to take all 6 kids. They were being unusually helpful and agreeable, so I just kept shopping, grabbing as much as I could until I thought they had had enough. Two trolleys later (with the Teenager pushing the second trolley with a toddler on-board), we headed for the check-out. And that’s when everything went Pear-shaped. They completely lost it! As we left the check-out with what was left of my sanity I smiled sweetly at the check-out operator and in my most jovial voice said “And they were doing so well!” Then I made a hasty retreat. So I know how hard it can be to shop with kids. Personally I avoid it at all costs. And yesterday these kids were being pretty good, but every shopping aisle was packed and it easily added an extra half an hour to my trip. Especially when I headed to the check-outs to find only three open, each with at least three full trolleys lined up, yet nobody was choosing to go through self-serve. So off I went to self-serve, grabbed a second trolley and loaded everything into that trolley after I bagged it. The lady supervising was very impressed and told me I had done a pretty good job. I was in and out of there before I knew it. Maybe I have a future at Woolworths! Once home I unpacked everything and decided that while I potentially had everything I needed to make anything the family wanted for dinner, I was way too tired and it was going to be steak and chips. Which brings me to the sauce. A great sauce can take an ordinary meal and turn it into something special. 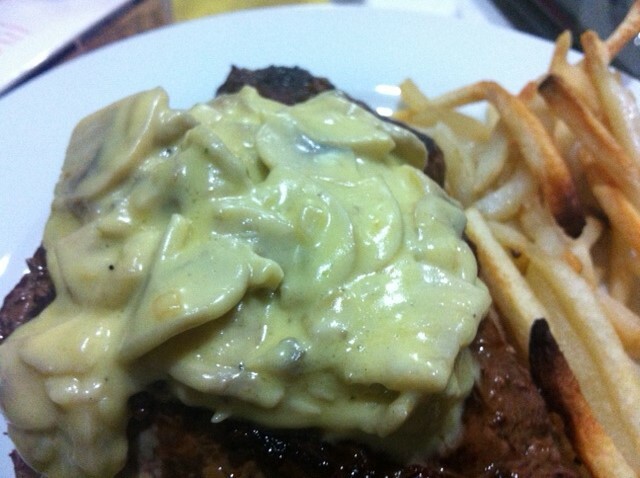 And I think this Creamy Mushroom Sauce is pretty special. It’s super-easy, super-quick and a real crowd pleaser. Nobody cared that I had slightly burnt some of the chips and the kids even tried the mushrooms. I chose to add some white wine for that extra punch of flavour, but it’s completely optional (though I highly recommend it). So if you’re looking for a way to jazz up a quick meal of steak and chips, I’d give it a go. Heat the oil or butter in a medium saucepan over medium-high heat. Add the sliced mushrooms and garlic and stir-fry them until they are lightly browned, taking care not to burn the garlic. Then reduce the heat to medium. Add the cream, white wine, salt and pepper and bring the sauce to the boil, then reduce the heat to simmer the sauce, stirring occasionally while you cook for approx. 5-8 minutes. Watch carefully that the cream doesn’t over–boil. Once the sauce has reduced by half, serve steak.